The Mission Possible contest asked students to identify areas of improvement to school nutrition and physical activity programs along with how to implement these changes. Student teams from McClintock, Bradley, Mint Hill and Northeast Middle Schools pitched their ideas to the judges’ panel, who included CMS Officials and Carolina Panthers Director of Community Relations. The judges asked questions and used scoring criteria to determine prize winners. Carolina Panthers Kicker Graham Gano presented the grant prizes to the student teams. The $1,000 3rd Runner-up prize was a spontaneous donation from Panthers Charities. All four participating teams will receive a Love Your Lunchroom prize kit to makeover their school cafeteria with the Carolina Panthers Fuel Up to Play 60 logo, valued at $3,000. Fuel Up to Play 60 is an in-school nutrition and physical activity program and partnership of the National Football League (NFL) and National Dairy Council. It is administered in North Carolina by The Dairy Alliance. 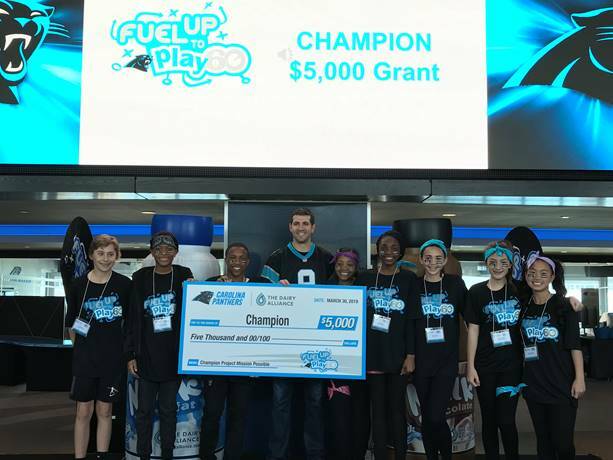 Since the program began in 2009, the dairy farm families in the Carolinas have invested over $1 million to support Fuel Up to Play 60 in their schools. “This is a special relationship we have with the students through Fuel Up to Play 60. They are doing great work in Charlotte to get kids proper nutrition and physical activity” said local dairy farmer Jackie Lowman. “We’re proud to do our part providing milk to drink and encouraging kids to make healthy choices for their life”. On behalf of dairy farm families, The Dairy Alliance, a non-profit organization, works with schools, health professionals, retailers, dairy processors and the public to promote dairy foods. For more information, visit thedairyalliance.com.